When you go to a YouTube channel, you’ll immediately be greeted with a large banner displaying the channel name. This is your cover photo and is prime real estate for introducing your brand. You can make your cover photo as extravagant or minimal as you’d like, but just make sure that your brand is the focal point, as it’s going to be the first impression someone gets upon entering. Luckily, there are a great assortment of tools to get you started if you don’t happen to be a seasoned graphic designer. Friendly reminder: YouTube recommends uploading your cover photo at 2560 x 1440 pixels with a maximum file size of 4MB. Since you’re starting a YouTube channel for your own business, you should have more than enough source material to work with, and you can approach your video content in more than one way. If you have a complex product and want to empower your customers to learn more about it, video tutorials might be a great avenue for you. Want to show off great reviews from your customers? Testimonials may be the way to go. Even better, do both! This way, your channel has a variety of content to consume, which can resonate with different viewers. You should also create content that’s aimed at your target demographic of your business. The more that you cater to your target market, the more likely they will want to look into your business services. Like your channel art, you’ll also want to create your channel trailer. Channel trailers are usually short and sweet, and are a good introduction for new visitors. You can let your audience know who you are, what your business is all about and what kind of content they can expect to see in the future. Creating your channel trailer will also be good practice leading up to your first video. Once you’re done filming and editing your first video, it’s time to upload it. Given that YouTube relies on video uploads, you’ll find the upload option at the top right of the screen when you log into your account. When uploading a video, you’ll be asked to fill in a title, description, and tags. These are essential components to have your video easily discoverable in YouTube search, so don’t skimp on them! Much like SEO for your own website, YouTube has its own set of parameters for you to optimize your video for search. Fill these sections out to the best of your ability using keywords to describe the video and your business. A keyword-rich (but not heavy) title and description can go a long way and you’ll be able to see what works for your videos as you progress. Don’t expect success if you plan to create a YouTube channel, upload one video and then neglect it completely. Creating a successful YouTube channel takes time and effort, and viewers expect consistency from the channels that they subscribe to. After your first video, be sure to plan the next few videos ahead of time. Unsure if you’ll have time to shoot a video every week or every other week? Not a problem! Take a day out of your schedule to shoot more than one video and release them on your own schedule. You have a website and now a YouTube channel. Great! Now it’s time to share your videos outside of YouTube and your website should be their first stop. Here are a couple of ways to showcase your videos on your website. Front and center: Your videos take time and effort to create, so why not show them off? 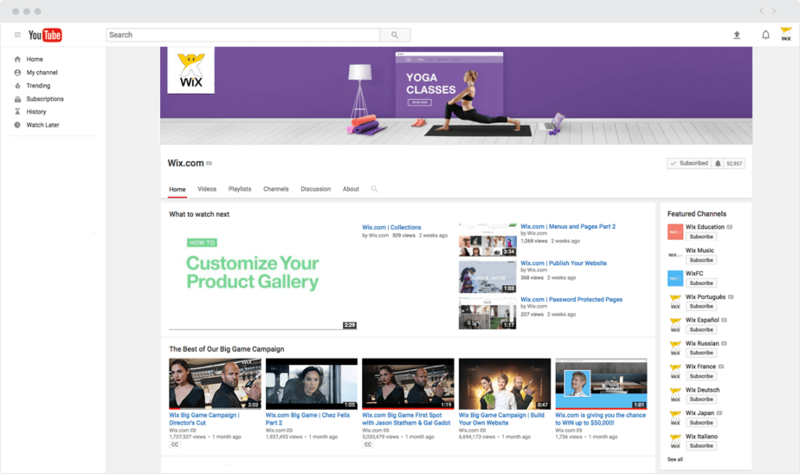 You can add your YouTube video to the home page on your website so it’s one of the first things that a visitor will see! Blog all about it: If you have a blog on your website, then your YouTube videos have a home away from home now. You can embed them right into new blog posts and even tell your website subscribers by sending a newsletter! Go Social: Take pride in your work and share your content on your business social networks. The more you share, the more exposure, and that’s what this is all about. Share it everywhere! YouTube wouldn’t be what it is today without viewers actively viewing and engaging with video content that businesses like yours and people like Jenna Marbles create, so make sure to engage back! You need to build a community around your channel, and engaging with your viewers is a very important step. Reply to comments, ask and answer questions, and most importantly, listen to them! Your viewers want to watch your content, so remember to give them what they want. With a well-nurtured community, you’ll likely get some free word of mouth advertising in the process, too. Ready to take things to the next level? At some point, you may want to look into investing into YouTube Advertisements to get your brand out there even further. Even if you’re not sure where to start, there’s a wealth of information available to you to get you where you need to go. If you’re looking to target a specific age group, gender, interest, or location, YouTube Advertising can help you do it all. It’s not imperative that you use YouTube ads, but it could very well be a suitable offering for your channel. Just remember that with the right combination of content and engagement, much of your growth will be organic. YouTube ads can just be the icing on the cake. Analytics will allow you to get insight on the people who are watching your videos, which allows you to hone into your target demographic even further. It’ll also give you a better idea as to why one video may have performed better than another. It’s a powerful tool for your budding channel.